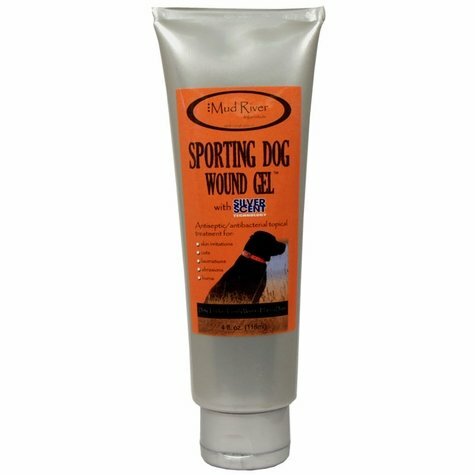 Mud River Sporting Dog Wound Gel with Silver Scent Technology antiseptic / antibacterial topical treatment is an odorless and colorless gel that can be applied directly to the affected area and does not attract other pests, dust, or dirt allowing for the wound to heal much faster. Use for skin irritations, cuts, lacerations, abrasions, and 1st or 2nd degree burns. With 24 PPM of silver, Mud River Sporting Dog Wound Gel promotes the fast and natural healing of wounds from the inside out by killing bacteria to prevent infection and moisturizing the wound to ease discomfort. The patented technology behind Silver Scent contains a unique silver molecule which is intentionally missing two electrons in its outer shell. While one electron is busy destroying bacteria, viruses, and mold, the other is being recharged allowing a rapid-fire seek and destroy method to control and eliminate all unwanted odors. The result is a solution that can kill thousands of times more pathogens in a single application.